First Edition a 2013 Doody‚ Core Title and AJN Book of the Year Award Winner! This text provides top-tier guidance for DNP students, graduate faculty, APRNs, and other health care providers on how to use available research for improving patient outcomes and reducing costs. It is the only resource written expressly to meet the objectives of DNP courses. This second edition is completely updated and features three new approaches umbrella reviews, mixed-method reviews, and other types of reviews for seeking, synthesizing, and interpreting available evidence to improve the delivery of patient care. The text also includes two new examples of completed systematic reviews and two completed proposals. The book presents, clearly and comprehensively, the knowledge and skills necessary to conduct a foundational comprehensive systematic review (CSR). It encompasses the complexities of the entire process, from asking clinical questions to getting the evidence into practice. The text includes question-specific methods and analysis and compares CSR methods, literature reviews, integrated reviews, and meta-studies. 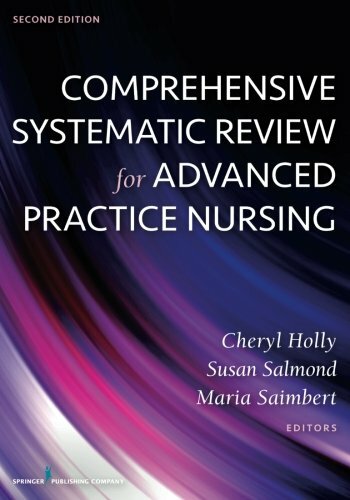 It describes how to find and appraise relevant studies, including the non-published grey literature and criteria for selecting or excluding studies, and describes how to use the results in practice. Also examined are ways to disemminate findings to benefit clinical practice and support best practices, and how to write a CSR proposal, final report, and a policy brief based on systematic review findings. Plentiful examples, including two completed proposals and two completed systematic reviews, demonstrate every step of the process. An expanded resource chapter that can serve as a toolkit for conducting a systematic review is also provided. The text covers useful software and includes objectives, summary points, end-of-chapter exercises, suggested reading, and references.